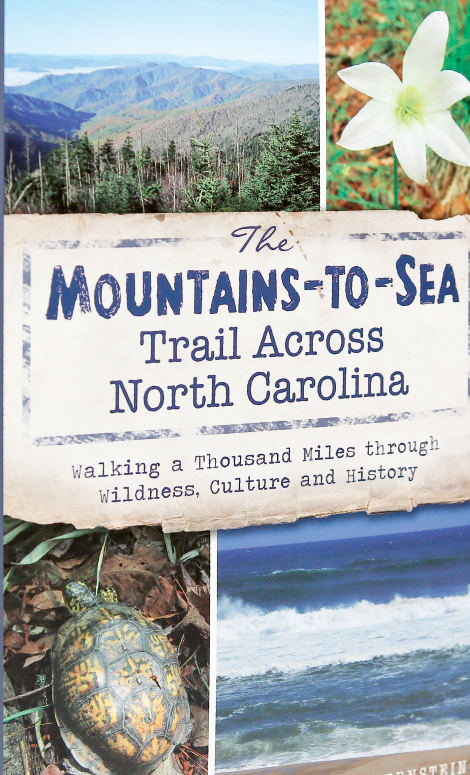 After logging thousands of miles over more than 40 years, author and Carolina Mountain Club hike leader Danny Bernstein presents an account of her 15-month, statewide trek in The Mountains-To-Sea Trail Across North Carolina. Her third hiking book proves a knowledgeable and enthusiastic guide as she leads travelers on a thousand-mile journey from Clingmans Dome in Great Smoky Mountains National Park along footpaths and back roads, ending in the coastal town of Nag’s Head at Jockey’s Ridge State Park. Bernstein prepares hikers for what they can expect along the way, addressing safety concerns—snakes, wild animals, and dangers posed by hunters and motorists—and offering tips on making the most of the scenic and historical attractions. Bernstein also delves into the history of many key locations and explores charming communities, listing her picks for the best pit stops for hikers in need of refreshments and sundries. The author will offer a talk on May 18 in Flat Rock during the Blue Ridge Bookfest. Visit www.hikertohiker.com/wheres-danny-now for details. For anyone with a taste for traditional song and dance, the Blue Ridge Mountains offer rich veins of melodious folk music. Author Fred C. Fussell explores Western North Carolina’s musical heritage and its most revered practitioners, past and present, in the second installment of Blue Ridge Music Trails of North Carolina. Fussell and co-author Steve Kruger take readers on a tour of communities with vibrant, traditional music scenes. Legends like Doc Watson and Earl Scruggs are given their due, as are the many fiddlers, cloggers, flat-footers, banjo players and makers, old-time string bands, and murder ballads that contribute to the melting pot of Appalachian sound. Also included is a CD with more than two dozen songs representing the diverse styles profiled in the text. It’s a fitting soundtrack whether you’re sitting back reading or hitting the road. Appalachian scholars are familiar with the historic journey Olive Dame Campbell and her husband, John C. Campbell, made from eastern Kentucky to Western North Carolina in the early 20th century. The folklorists and social reformers collected a wealth of information about the people and customs of Southern Appalachia. The diary Mrs. Campbell kept during her travels has long been considered a treasure trove of turn-of-the-century mountain culture, but the weathered, decaying document has not been widely available to the public. Now, Elizabeth McCutchen Williams, a research librarian and assistant professor at Appalachian State University, has edited and annotated the original document to create the definitive version of the diary. Campbell’s warmth of spirit and generous attitude toward the mountain dwellers she met and interviewed shines through in this meticulous recreation of the text.